We met with my new oncologist today. She's very nice and very professional. As she went over the results of the ultrasound, I was happy to hear there was nothing visible other than dense scar tissue. The pain I'd been experiencing was due to the regrowth of nerves in that area. Dr. Ninan explained it can take up to three years for nerves to regenerate and grow. Since I'm still having severe back pain, she wants me to have a bone scan next week. We'll discuss my treatment options depending on what that scan shows. After we finished our time with the doctor, Phil and I wandered through the facility. I hadn't had a chance to learn my way around and the patient advocate assured me there were some areas I'd want to visit. We made our way up to the fifth floor to the rooftop terrace. 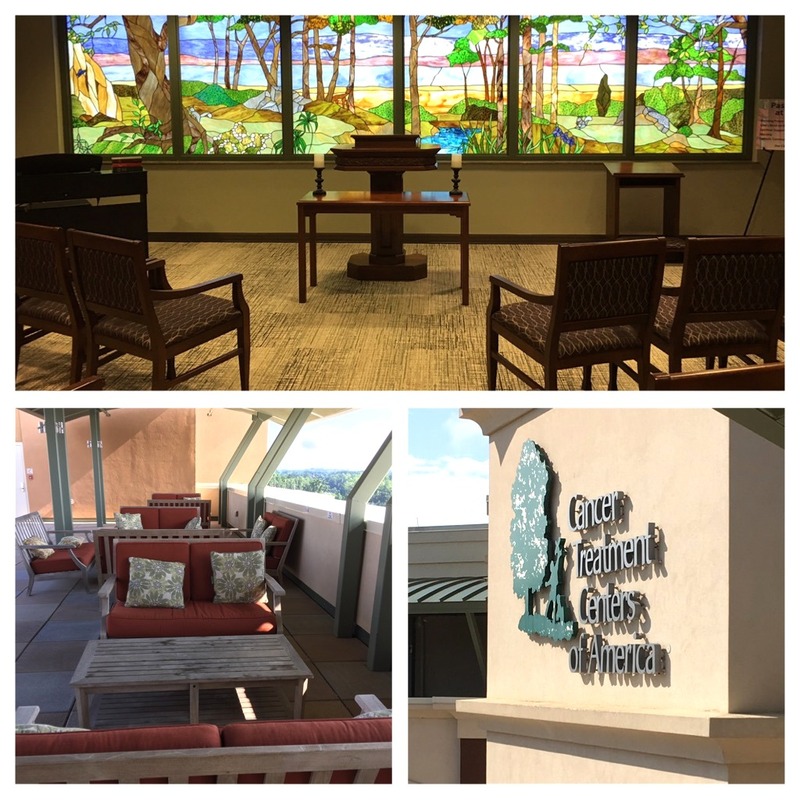 There, patients had the freedom to lounge in outdoor breezes under the shade of the rooftop pergola. Comfy seating and complete quiet provided a getaway from the hustle and bustle of the downstairs areas. We also visited the chapel located on the second floor. This small worship area was beautifully designed and featured a lovely stained glass window. Worship services are held throughout the week and on Sundays. Phil was amazed at all the attention to detail in the center. He couldn't get over the fact that there was an onsite Hair Salon, Restaurant, Gift Shop, and Acupuncture center. It was a good, productive morning. I was thankful he was able to go with me to my appointment. He's been having to work so many Saturdays lately, I was worried he couldn't go. It always makes me feel more at ease to have his moral support.